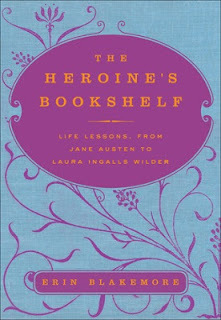 Literature is full of memorable heroines who have achieved the great and overcome the terrible. Author Erin Blakemore guides readers through some of her favorite characters and the authors who created them. book-lovers of all ages. Reading her essays, which explain how heroines of classic literature exemplify characteristics including Fight (Scarlett O'Hara) and Compassion (Scout Finch), is much like discussing a book with a favorite friend or relative. They are personal essays, yet show how each work reviewed is universally relatable. Just as interesting is the biographical approach to Blakemore's criticism: the book shows how each author's life influenced that of her heroine. The biographies are brief, but fascinating--snippets that you wouldn't necessarily learn in a high school English class. One of my favorite parts of HEROINE'S BOOKSHELF is how it reminds its readers why we love to read. It's more than simple escapism: we latch on to these amazing characters and allow them to guide us toward meaning in our own lives. Market: Adult nonfiction, literary criticism/analysis. The book would be appropriate for readers of any age. This sounds like a fun and inspiring book! Who doesn't love to learn from a heroine?